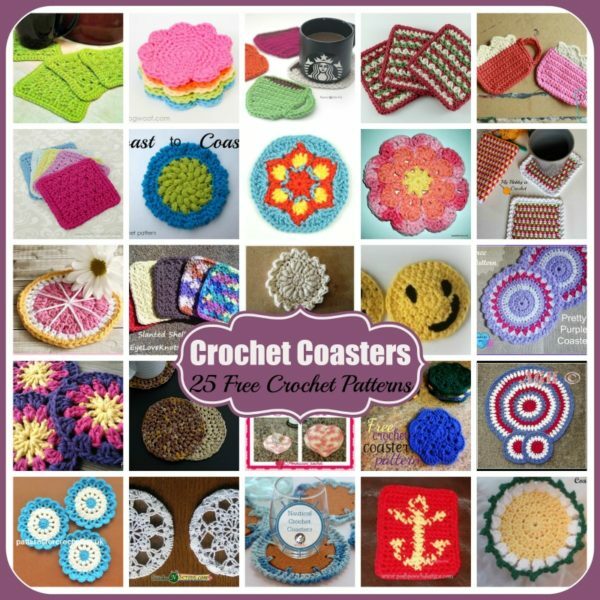 A Roundup of 25 Free Crochet Patterns for Crochet Coasters. 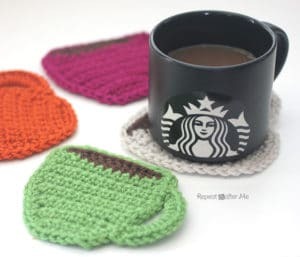 Crocheted coasters always come in handy whether at home or at the office. They are great for protecting the tables as well as for catching any drips from your coffee cups. And another cool use from them is that they can also be used as scrubbies in the kitchen or the bathroom. I, for one, like using mine to do a quick dust of my laptop and desk before I throw it in the wash. 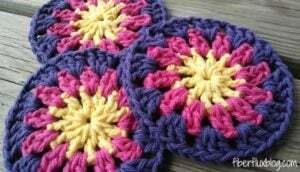 So browse on through this awesome collection, and I hope that you’ll find various ways to enjoy this collection of free crochet patterns. This gorgeous motif measures 4.5″ across. 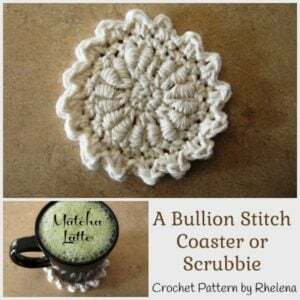 It’s the perfect size for all your coffee mugs, but might also look lovely as a small doily, or when pieced together into a cozy wrap. This pattern is short and sweet, making it a great pattern to learn Tunisian crochet. Plus, it’s got a lovely texture that’s perfect for gifting to your friends and family, or anyone at the office. 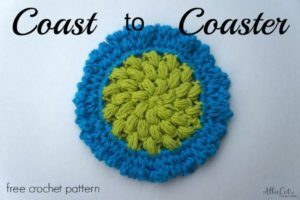 If you know how to crochet the bullion stitch, then you’ll find this coaster pattern a breeze to whip up. 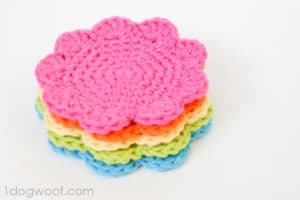 In addition to a coaster, the texture also makes this perfect for a cute little scrubbie. 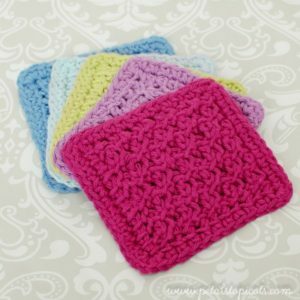 This coaster set is crocheted in a DK weight yarn, making it lightweight and full of lovely textures. 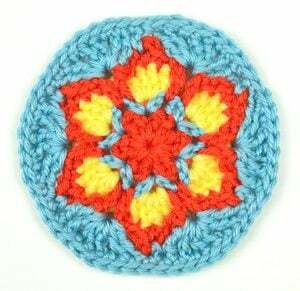 I love the pretty colors and the stitch pattern in this lovely design. 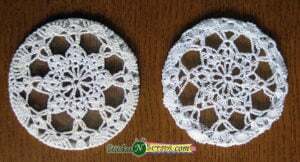 The finished size is 4.5″, making it also suitable for a small doily. Enjoy the cheerful colors in this coaster as you sip your morning coffee. The stitch used is also called the moss or the linen stitch. 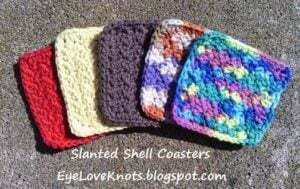 If you love shells, then you will enjoy these cute coasters. Plus, the pattern is mindless once you get going on it. Love coffee? Then why not show it off with these adorable coffee coasters. And they’ll make for cute gifts around the office as well. 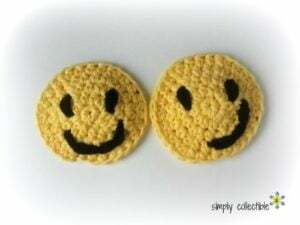 Let these adorable smiley coasters get you off on the right track every morning. 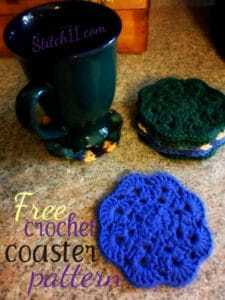 They not only make for great coasters, but you can also use them as appliques. 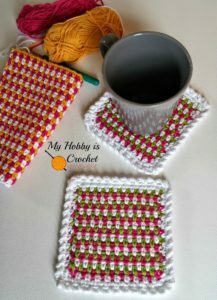 This looks like a pretty solid coaster with the padded stitches. Plus, it’s got a pretty edging as well. 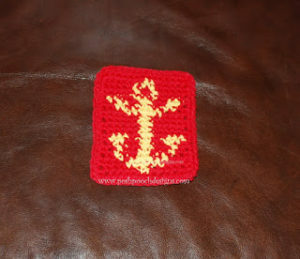 This coaster is perfect for boat rides in the summer. That is if you have one of those big and fancy boats. If not, use it around the home or out on the patio. Either way, it’s a lovely coaster to enjoy throughout the summer. The cocoa coaster makes for a lovely gift for anyone who enjoys hot chocolate with marshmallows. And that means this is great for children. This US patriotic table set includes a placemat and coaster pattern. 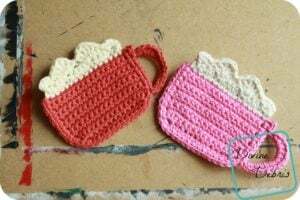 And not only is this a set to be used at the kitchen table, but the pretty colors and stitch pattern also makes this ideal for a lovely doily. Furthermore, the coasters measures 5″ across, making them for great scrubbers as well. These are almost to pretty to be used as coasters. To be honest, I would find a way to hang them up on the wall or display them in a frame. 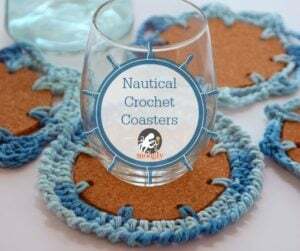 And, at first glance they don’t look like effective coasters; however, they are mounted onto a round glass which not only protects against spills, but against the heat as well. This gorgeous motif is perfect for your summer holidays. I love the hot and fiery flames in the center, but choose any colors to get the look you want. 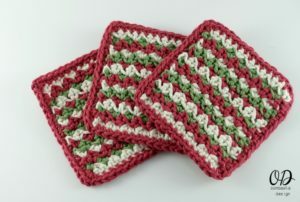 These pretty coasters are shown here in Christmas colors. However, if you substitute a blue for the green, you have yourself a lovely US patriotic design. 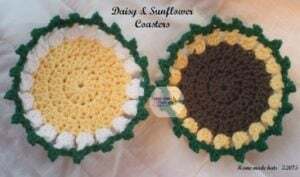 Crochet a daisy or a sunflower, simply by switching up your colors. One is great for the spring, while the other is perfect for the fall. Or, use them both throughout the year! You can’t go wrong with this pretty laced coaster. 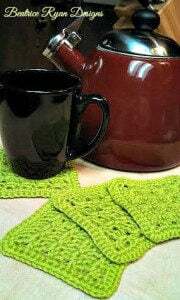 Crochet a set for yourself and a few for friends and relatives. Flowers are always so cheerful, and this one is no exception. I love the pretty yellow center. And it has the illusion of layered petals! It’s such a clever design. 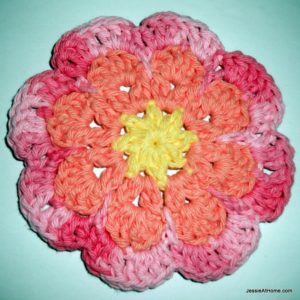 Although plain throughout, this pretty flower coaster has a nice petaled edge. It’s nice and solid for extra protection. These bright and cheerful coasters look like they’ll be enjoyed on the deck or on your office desk. And they make for a lovely stashbuster as well. 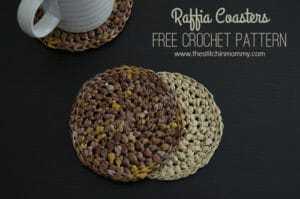 These raffia coasters also look like they are perfect for the patio or for indoors. And they look like they are sturdy and durable. Here is a delicious grapefruit coaster. 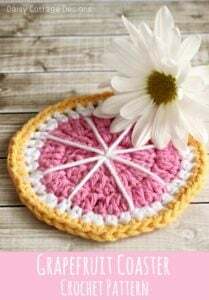 However, if you went with different colors you could just as easy use the pattern to do an orange or a lime. Show your friends and relatives that you care by including a set of these heart coasters in their gift basket. If you spend a lot of time on your patio then you won’t want to miss out on these awesome coasters. And they’ll be just as lovely inside as well. 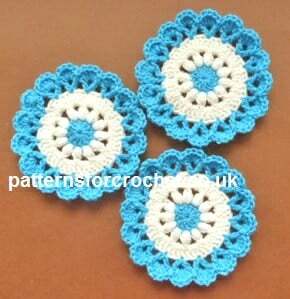 So there you have another roundup on 25 FREE Crochet Patterns. 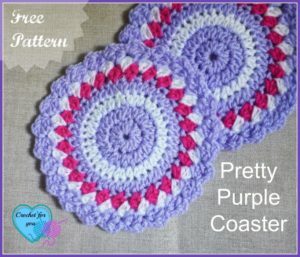 You can check out more pattern roundups on this blog, or visit Crochet Pattern Bonanza for even more free patterns for Crochet Coasters.